Director – John Cameron Mitchell, Screenplay – Philippa Goslett & John Cameron Mitchell, Based on the Short Story by Neil Gaiman, Producers – Iain Canning, Howard Gertler, John Cameron Mitchell & Emile Sherman, Photography – Frank G. DeMarco, Music – Matmos & Nico Muhly, Dyschords Songs – Martin Tomlinson & Bryan Weller, Visual Effects – Bridget Fullan, Phosphene (Supervisor – John Bair) & Shade VFX (Supervisor – Karl Coyner), Special Effects Supervisor – Scott MacIntyre, Production Design – Helen Scott. Production Company – Film 4/Screen Yorkshire/Delish Films/Cross City Films/Hanway Films/See-Saw Films/Little Punk Productions. Croydon, London, 1977 in the midst of The Queen’s Silver Jubilee celebrations. Henry, or Enn as he prefers to be called, is a fan of the new punk movement and produces his own comic-book. He and his best friends John and Vic head to a party after a gig but instead end up at a house that has been taken over by a group of visiting aliens. Unaware that the others are aliens, the three of them mingle among the strange goings-on. Enn is attracted to Zan, one of the alien girls who is eager to break with protocol and seek individual experiences. Enn inspires her to stand up to the rest of her group and she joins him, heading off to explore the outside world. They tell Em’s mother and friends that she is a visiting American. Throughout the course of this, Enn and Zan fall in love. However, she has only 48 hours before her people must return and the rest of the group are wanting her back. Moreover, what she does not tell Enn is that her fate is to give birth and then be eaten by her young. How to Talk to Girls At Parties is a collaboration from two talents that you don’t think mix at first glance. As director and co-writer, there is John Cameron Mitchell who directed and played the title role as the transgender performer in Hedwig and the Angry Itch (2001). Mitchell has also made Shortbus (2006), a full-on film about modern sexuality which has some fantastic content, and the drama Rabbit Hole (2010), plus has made a number of other acting appearances. Furthermore, the film is based on How to Talk to Girls at Parties (2006), a short story by Neil Gaiman, the celebrated fantasy author responsible for works such as Neverwhere (1997), Stardust (2007) and American Gods (2017– ), among others (see below for Gaiman’s other works). In a cute in-reference, we see in the final scenes that the adult Enn has become a comic-book artist who resembles Neil Gaiman, dressed all in black at a signing with posters for Gaiman’s breakthrough comic-book Sandman (1989-96) in the background. How to Talk to Girls at Parties is an oddity. For one, the title suggests something more like a book of pick-up lines than it does a comedy about alien visitors. Even when you appreciate that the title is meant ironically, it doesn’t exactly shout out being a work about the difference between human and alien cultures. Audiences seemed to think so too – the film was shot in 2015, premiered at Cannes in 2017 and then sat in limbo for a year before being released to very mixed reviews. 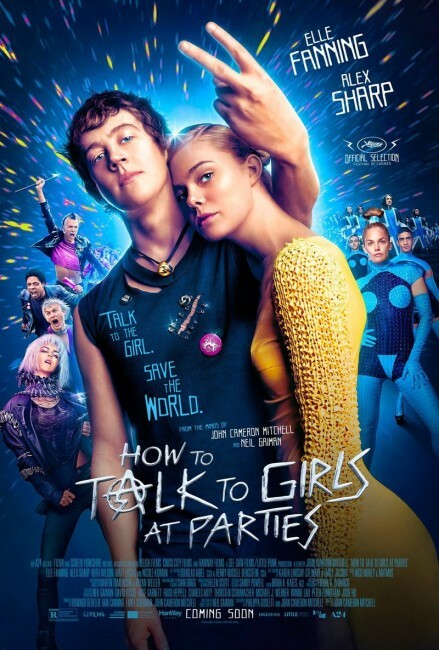 For all that you have hopes on the basis of the John Cameron Mitchell and Neil Gaiman names, How to Talk to Girls at Parties never quite comes together. Mitchell takes the setting of England during the punk movement but never seems to tap the essence of the phenomenon. Given that it is made by an American director, the film lacks an essential feel for England in a bygone era. It is more like a posture of people dressed up and pretending to be punks rather than something rooted in the ethos of the era – to me, punk was always a sneering at the establishment and conventional mores, celebrating a rejection by society. 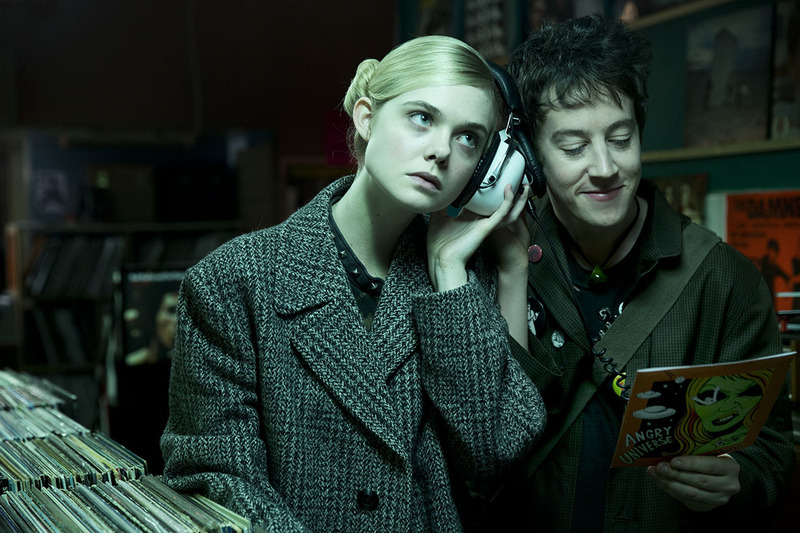 What punk never seemed to be about was a twee romance, which is what the film becomes. It was about the socially disaffected and angry working class youth of the era, not likeable schoolboys who live at home with their mothers and draw comic-books. Both works like Sid and Nancy (1986) and Shane Meadows’s This is England films (although set a little later) feel more authentic at tapping the attitude of the era. This tries but when you have Australian star Nicole Kidman affecting a bolshie East London accent, or recognisable faces like Joanna Scanlan, Ruth Wilson and Stephen Campbell Moore popping up in the midst, it tends to puncture the bubble. Boiled down to it, How to Talk to Girls at Parties is not very different from an alien visitor comedy like My Stepmother is an Alien (1988), Coneheads (1993) or What Planet Are You From? (2000) – the only real difference is that John Cameron Mitchell neglects the comedy angle. There is the occasional moment of culture clash that amuses – like a scene where Elle Fanning is passed off as an American to Alex Sharp’s friends and tries to improvise a series of answers to the question “What do Americans think of the Silver Jubilee?” with hilariously wrong results. But mostly, John Cameron Mitchell never makes a very funny film when you keep expecting him to. He certainly has a good deal of energy for the montage scenes of Alex Sharp and Elle Fanning running around together. The aliens themselves have a low-tech oddity – they come in coloured PVC suits like something out of the musical Taboo (2012) crossed with Barbarella (1968). Neil Gaiman emerged in the 1980s with the highly celebrated graphic novel series The Sandman (1989-96) and subsequent works like The Books of Magic (1990-1) and Marvel 1602 (2003), as well as various high-profile issues of ongoing comic-books like Black Orchid, Miraclemen and Swamp Thing. Gaiman has since branched out into writing books, beginning with the non-fiction Ghastly Beyond Belief (1985), which published a compilation of bad prose from science-fiction literature; Good Omens (1990) co-written with Terry Pratchett, which satirises End Times/Anti-Christ themes; and novels such as Stardust (1998), American Gods (2001), Anansi Boys (2005), Interzone (2007), The Graveyard Book (2008), Odd and the Frost Giants (2008) and The Ocean at the End of the Lane (20130. On screens, Neil Gaiman has written one episode of tv’s Babylon 5 (1993-8); the fine tv mini-series Neverwhere (1996) set in a world that exists beneath the streets of London; the English-language screenplay for Hayao Miyazaki’s Princess Mononoke (1997); co-created the amazing MirrorMask (2005); the screenplay for Robert Zemeckis’s animated Beowulf (2007); two episodes of Doctor Who (2005– ); as well as had film adaptations made of his novels with Stardust (2007), Coraline (2009), the tv series American Gods (2017– ) and the tv mini-series Good Omens (2019).